My goodness...does it seem as though Spring is really taking its time this year? I just want to be able to eat outside and enjoy the sunshine! This Wednesday I'll be attending COFES in Phoenix, Arizona and I hope I'll finally get my wish. I love COFES because it's a conference where all the leading design software companies attend and for 4 days we all play nicely together. After selecting an image you'll be asked for the usual questions such as insertion point, scale and rotation angle (much like the XATTACH command). All the other cool Image commands are in AutoCAD LT 2009 as well! You'll find the IMAGECLIP command that lets you clip your image to a polygonal or rectangular shape. You'll find the IMAGEADJUST dialog box the lets you control the brightness, contrast and fade of your image. 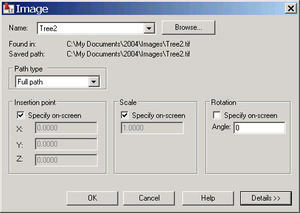 IMAGEFRAME controls the visibility of the image frame. and IMAGEQUALITY can be set to Draft if you find your images are slowing your drawing down by too much. Bonus Tip: Set IMAGEFRAME to 2 so that the frame displays but doesn't plot!